WaveWorks have launched a new Kickstarter campaign this week to raise funds to take their new handcrafted smart jewellery into production. The jewellery that seamlessly blends technology, art and social networks together is now available with pledges starting from $185 for the Diamodo ring. 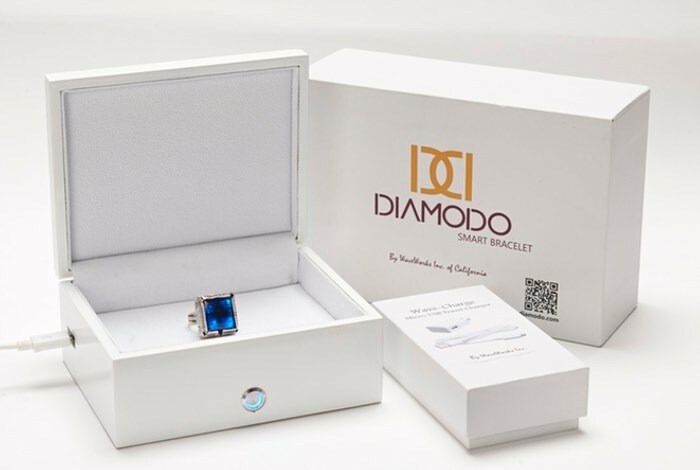 Diamodo is supplied in a special jewellery box that charges your jewellery when it is not being worn, and the objects can simply be dropped into the box to start the charging process. Watch the promotional video below to learn more about this new handcrafted smart jewellery. What makes it distinct from other wearable technologies? There are still challenges in reaching a very solid system after bringing all the pieces such as the jewelry, software, apps, firmware and the traffic servers all together. Another challenge is keeping up with the demand. It would require literally a city full of craftsmen to handle handcrafting of the pieces. A test process is already in place to try out production prototypes and clean all the hardware and software weaknesses and bugs. If everything goes well in all the hardware, the software and the art; all the gift samples would be shipped by mid November two weeks after the end of the campaign and just before the thanks-giving holiday. All the features have to be extensively characterized and analyzed statistically in detail to reach a robust design. For more information on the new smart jewellery jump over to the Kickstarter website for details by following the link below.